From the developers of the remarkably popular ShowMe comes Markup ($1.99, app website here), an intuitive and simple-to-use annotation app, specifically designed for educators. I have up to FIVE promo codes to give away to lucky teachers. Read ahead to see how to receive one. I did a quick post about the idea of Markup a few months ago when the ideas behind Markup surfaced. Markup allows educators to provide feedback and evaluate student work. 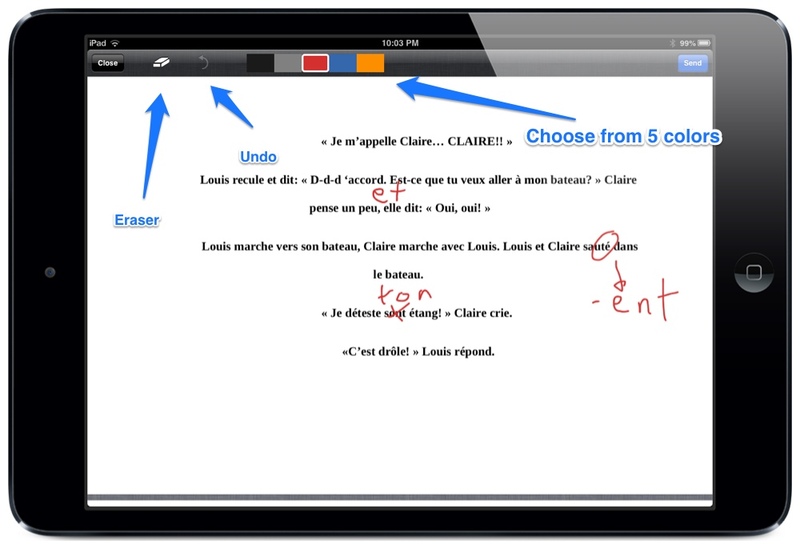 Teachers can quickly and easily grade papers and other types of assignments from their iPads. A huge potential for no more stacks of loose paper! 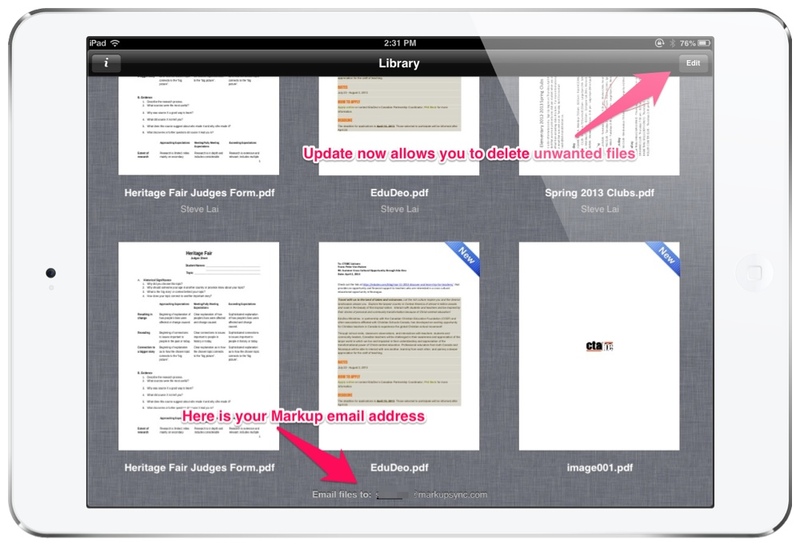 Import files into Markup, grade them, and send them back via email to your students, all from your iPad. This is a distinctive feature: Give your students your specifically designated Markup email address, and you will not have to worry about having to import files into the app. All files will be automatically added to the app. PDFs will work best. Microsoft Word files also worked for me, and, as soon as they are imported, were automatically converted to PDF as well. If you prefer, have them email you at your usual work email address, then forward the files you want to use to Markup yourself. A recent update now allows all users to delete unwanted/finished files from the app. You have an option on your device to receive a notification when you receive files through email sync. Above: The view of your Markup files resembles that of iWork, but the Thumbnails are noticeably larger. This may pose a problem if you have many files to scroll through. If you would prefer not to use the email sync, you can use the “Open in…” feature and choose Markup. You will be able to do this from various other apps, or from your email attachments in the Mail app. I was easily able to open PDFs from Dropbox and Box. The Markup option was available. However, for .doc files, it was not available. If you make a mistake in your marking, you can either tap the Undo button or use the eraser feature. Please note that once you close your file, your annotations are permanent and no longer eraseable. If your document is more than one page, scroll down files using two fingers. Tap the Send button at the top right. I would suggest sending yourself a copy for your records (Markup actually defaults this by putting your address in the “To:” field.) Add your student’s email address and thats’s it. You can use the sendtodropbox service to save a copy directly to your Dropbox. Who is Markup best for? For teachers who wish to use their iPads for quickly marking papers/assignments, Markup is excellent. 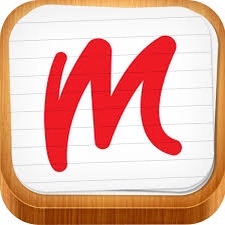 This app will come in handy for all teachers who are required to assess student work, especially those who prefer to use a stylus (as opposed to typing in annotations). The functionality, although minimalistic, is extremely easy to learn. Students will appreciate how they can receive an electronic copy in PDF of their work. Note: Although non-PDF files (.docx etc) are likely to work, my experience with importing them was hit and miss. For teachers who usually receive Word documents, having students save their work in PDF form is quite easy. On a PC, go to “Save As…” and choose PDF under the format. 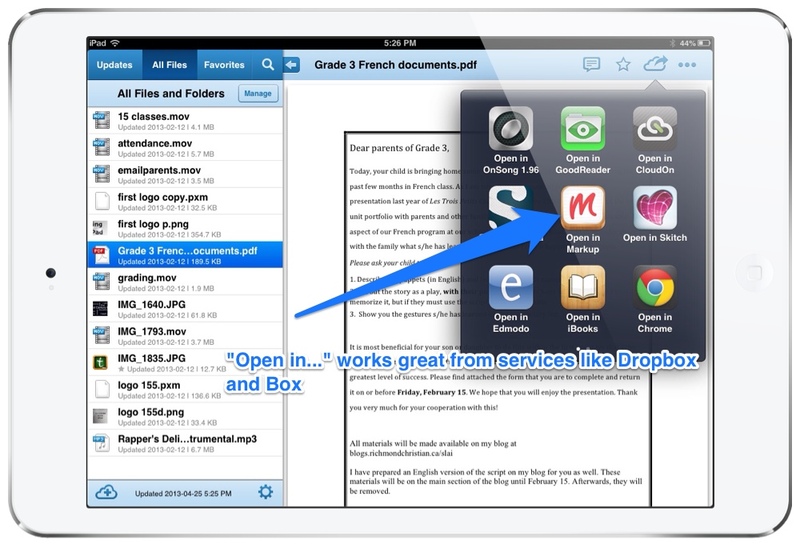 On iOS iWork (Pages, Numbers, Keynote), students can choose to export their work as PDFs. This app can be a great tool for teachers, and I can see great potential of it in the education sector. With a solid pedigree, having developed ShowMe Developer San Kin is working hard fixing glitches and bugs. He has mentioned that the next update of Markup will allow opening non-PDFs locally (using the “Open in…” feature, not the email sync unfortunately.) I appreciate the fact that he is promising an “effective and reliable app” for people who purchase Markup. This app will continue to improve, and I know the developers are always asking for opinions from users on how to make it better. It is extremely easy to use and a great way of saving paper. Students do not have to print assignments, yet they will still receive proper feedback on their work, with everything being done (from the teacher’s standpoint) from an iPad. For less than $2, I would suggest giving Markup a go. For annotating assignments using a stylus, this is an intuitive app that you will like. There are other ways to annotating PDFs (Goodreader, iAnnotate, and the newly updated Skitch apps come to mind), but if you want an easy to learn app, and prefer using a stylus (or even just a finger) to make your markings, this is the app for you. Tweet out ANY of teachingwithipad blogposts by using the Share button at the bottom of each post. Please include the hashtags #ipaded and #ipadchat. Share as many as you can/want. Pin ANY blogposts from teachingwithipad.org. Pin as many as you can/want. You can also use the Pinterest button at the bottom of each post. Leave a comment here with your Pinterest username. Leave a comment here on how you could benefit from this app. I will contact you directly via email if you are chosen (don’t forget to leave your email address). I only have TWO to give away. However, if there is a large Twitter/Pinterest response, I will personally gift THREE more to those who share the most posts from Teachingwithipad.org. I have NOT yet been told when these codes expire. I will let you know on an update to this post when I hear back from Markup. Thanks! What is your twitter handle?